It is a fact universally acknowledged that Elizabeth von Arnim was a bestselling author. 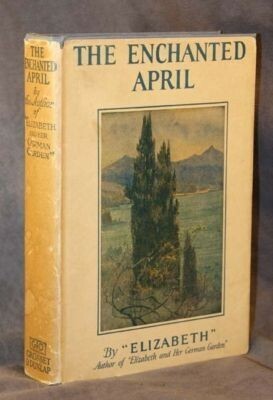 Her first book, Elizabeth and Her German Garden, was reprinted eleven times in the first three months after its publication in September 1898. By May the following year, it was available in the twenty-first edition. An American edition soon followed. Most of von Arnim’s books were serialised, and over the course of her career several of von Arnim’s novels were featured by the Book of the Month Club. Just how well von Arnim sold in the U.S. can be seen by a list of bestsellers on the American market compiled by Emily Temple for the Literary Hub. The list includes the ten best-selling books for the last 100 years. Von Arnim features not once, but twice! In 1919, Christopher and Columbus came in 9th, rubbing shoulders with writers as different as Joseph Conrad and Zane Grey. Even more impressive was the 3rd place for The Enchanted April in 1923. Von Arnim’s sales were bigger than Sinclair Lewis’ Babbitt that year. It’s a pity 1898 is not included. It would be safe to say that Elizabeth and Her German Garden would have been somewhere near the top.